Men all around you will stop shaving, we will stuff our bellies until we have no choice but to take a nap, aspiring writers will be crafting their novels, and a shopping frenzy will commence in the wee hours of the early morning on a Friday—that’s right folks, it must be November! As we turned the page on the calendar yesterday, so began the penultimate month of the year. One amazing part of November, aside from bearded men, never-ending turkey, new reading material, and scoring a great deal on the year’s hottest gift, is stopping to give thanks. It’s generally best to give thanks every day and not only on the last Thursday of this month. But with the advent of the popular 30 Days of Thankfulness Campaigns that kick off on the first day of November, it reminds us all to at least pause, give thanks, and be grateful for 30 consecutive days. That, you can do, right? Your friends, family, and accidental strangers will enjoy your month-long acts of gratitude, but what about your coworker, boss, office janitor, and that random guy who always manages to hold the elevator for you? Those at your place of business should have the opportunity to reap the benefits of your kind ways, too. 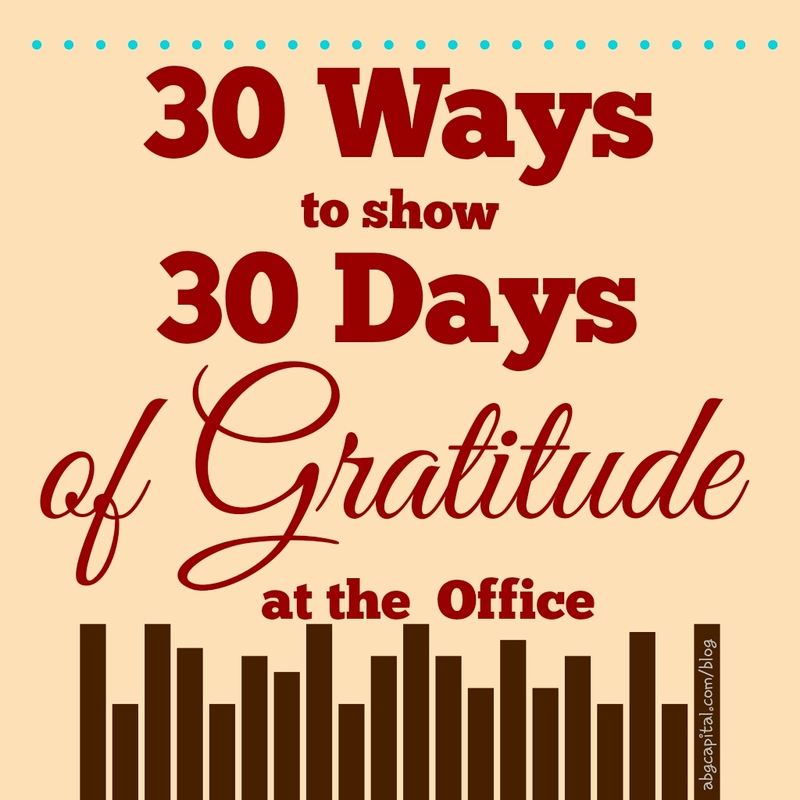 Here are 30 ways to show 30 days of gratitude at the office. You may have missed yesterday, but you can start right now. And remember, if your company is a standard Monday through Friday business, don’t let those weekend acts go wasted. Just double up on a Friday, Monday or throughout the week. Let no act of gratitude go undone! 1. The 30 days began yesterday, but here’s something you can do quickly if you happen to follow any of your coworkers on social media. Go to one of their sites, whether it be Twitter, Facebook, Instagram or something else and simply Favorite, Like, or Double-tap. This simple gesture shows that you took some time to care about something they care about–And not just lurked or scrolled by uninterested. 2. It’s Monday morning. Praise your coworker in a staff meeting in front of your peers. Verbally, out loud so all attendees can hear, tell them how your coworker has really been impressive with those TPS Reports. 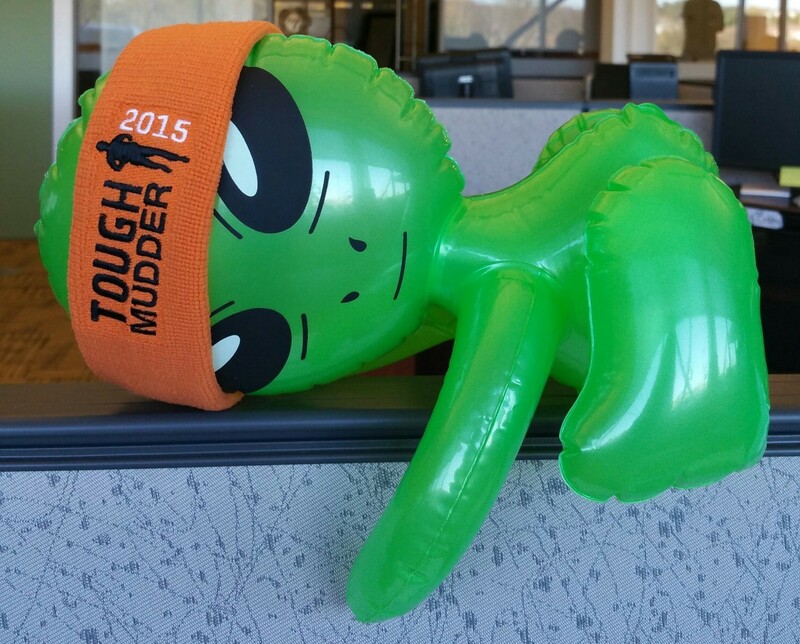 No “Case of the Mondays” for that coworker; he or she will feel great as the week begins anew. 3. November 3 is Sandwich Day. Jimmie Johns, Jersey Mike’s, Panera Bread or Subway, treat your cubemate to a sammy. 4. When is the last time you actually gave someone a genuine compliment? How about do it today? Whether it’s about how a job was performed or the briefcase, don’t keep it to yourself. Tell somebody. 5. “Remember, Remember the 5th of November.” Today is Guy Fawkes Day. Do you have a favorite coworker who manages to (thankfully) thwart your attempts at making an explosive act of trouble at the office? Treat that coworker today. Whether it’s a drink after work to discuss what drama caused his or her feelings this time, or making it a movie night to watch V for Vendetta. Bond and diffuse. 6. As you know by now, this past Sunday was Daylight Saving Time and we turned our clocks back one hour. So while it feels like 5 o’clock quittin’ time, it’s really only 4pm. Let your staff go early today. It’s been a rough week adjusting! 7. It’s Saturday and you’re in your jeans, a polo, Sperry’s. My how comfortable you are! 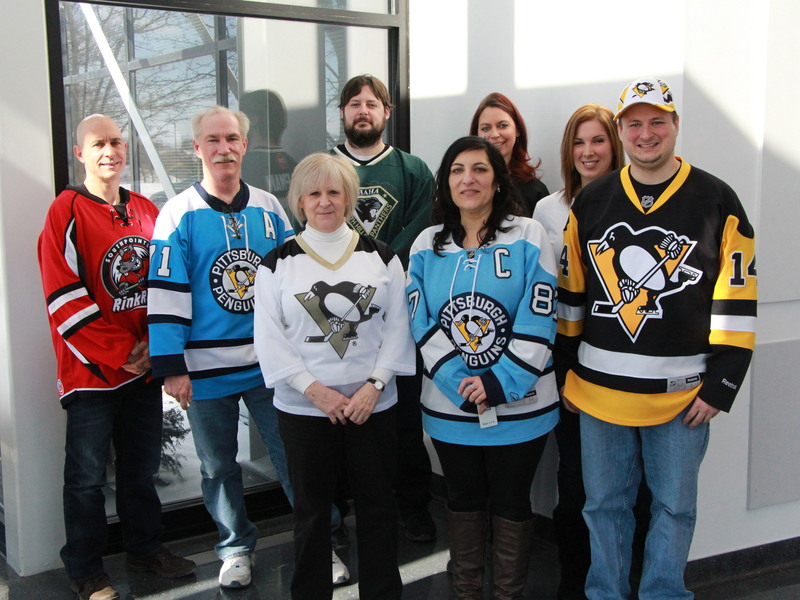 Treat your employees to a casual dress day, or a sports jersey day. They’ll be comfy. Are you happy when you’re comfy? Oh how thankful they’ll be. 8. Today is Cook Something Bold Day. If you’re in the kitchen prepping Sunday dinner, why not make something bold and bring it in for your coworkers tomorrow? You’re such a good cook. 9. It’s Monday morning and this obviously has to be on our list somewhere: caffeine. Thank your awesome coworkers, or boss, or doorman with some mocha-lotta-frappu-frothy something. On a chilly November morning, they’ll be oh-so-happy for your gratitude. 10. Forget-Me-Not Day is a real holiday that is happening today. Do you have anyone who’s on your mind that you should reconnect with today? A colleague that recently left and started a new position or perhaps that business prospect that you met at that networking event last month? Catch up, be sincere, and let them know they weren’t forgotten. 11. This is simple. It’s Veteran’s Day. Find a veteran and thank him or her. 12. Take a moment to thank the people who never get thanked. There are surely a lot of “thankless” jobs being done in your office building. Show these people that their daily tasks are appreciated. 13. It’s World Kindness Day! What a perfect day to be kind to every single person you encounter today. 14. Thank your coworkers by being a good person and replacing the last of something. Paper towels, napkins, coffee, etc. 15. Today is National Philanthropy Day. How can you be philanthropic at work? Your coworkers’ kids are usually selling something. Or maybe your office mate has a GoFundMe set up for a health reason. Or maybe your company has its own nonprofit. Make a donation! 16. One month ago today it was Boss’s Day. Did you forget? This would be a great day to thank your boss for everything he or she does for you. So, lunch is on you, right? 17. Are you friends with coworkers on social media? Do you ever interact with them? It’s National Unfriend Day, so take a moment to let them know they’re appreciated before you get the boot. Because, why else are you on there? 18. Does your office buddy have a desk collection of figurines? Why not surprise him or her by adding to the desk’s swag collection? Everyone loves thoughtful gifts, and this is a nice way to thank someone for simply being awesome. 19. This Thirsty Thursday, gather your team and take them out for happy hour. 20. A team building activity on a Friday afternoon is a great idea. Your team gets a half day and gets to bond thus strengthening the team. Hopefully they will be more grateful for each other and each other’s roles in the department! 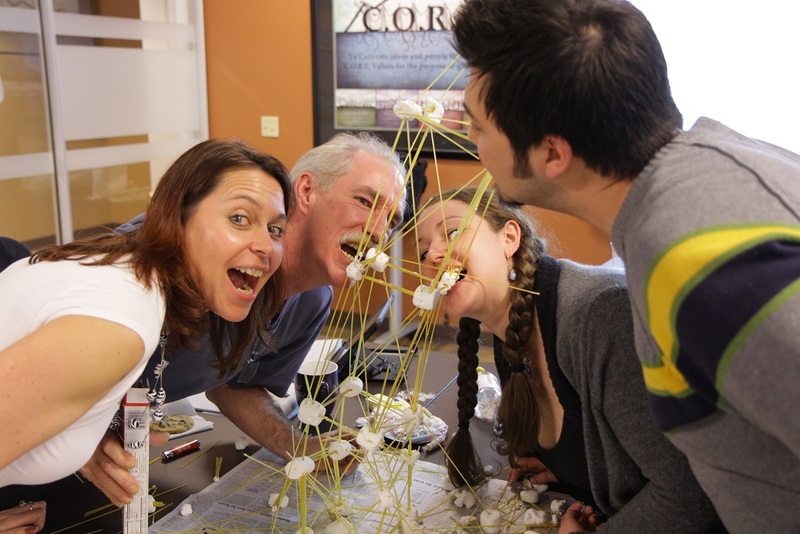 Activities such as office trivia, egg drop experiments, scavenger hunts, or building marshmallow spaghetti towers are fantastic for in-office team building. Outside of the office you can do such events as volunteering, fitness and/or sports activities, or professional development workshops and conferences. 21. Today is World Hello Day. How about saying hello to a few people you never talk to around the office? One simple hello could make someone’s day. 22. Sunday is a great day for baking! 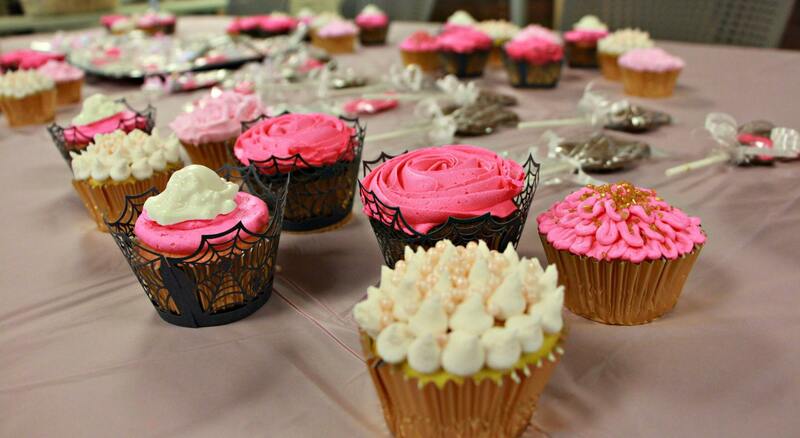 Make some homemade treats and take them to the office. 23. How often on a Monday morning do you ask, “How was your weekend?” How often do you actually actively listen and show interest in the answer? Do it! 24. Take a moment to ask someone these four words: “Can I help you?” Offer a new employee some assistance with a project or help him find his way around. 25. Studies have shown that working from home can save your employer money. That’s a great way to thank them! Today, work at home. 26. It’s Thanksgiving! How about taking a quick moment to thank your manager for hiring you? Having a job is certainly something for which to be thankful! 27. Do you have any of those delicious treats left over from yesterday’s feast? 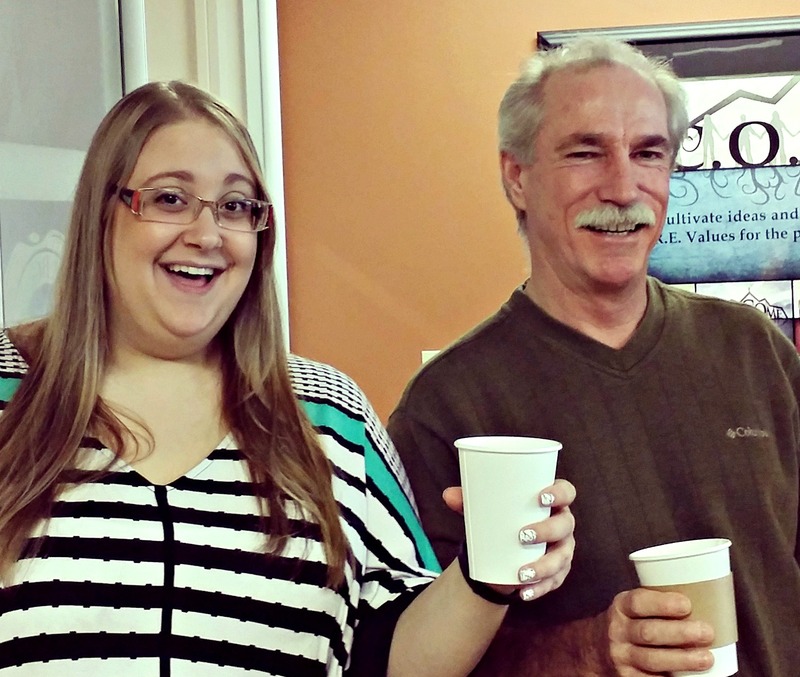 Treat your coworker’s and bring them to work. Everyone may not have had the festive, family and feast-filled day that you did; share the wealth. 28. It’s a holiday weekend, your staff has been working hard. How about thanking them with the gift of time? Let them take a long lunch break. 29. There is no I in Team. There is also no one department more important than the other. All teams are important to the success of your organization, but some can overshadow others. 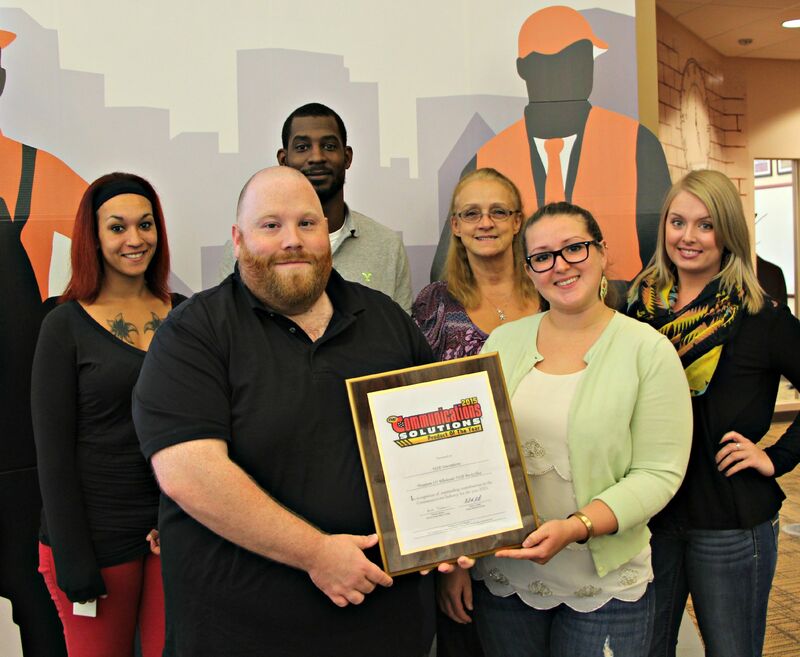 Take this day to recognize other departments and shout them out in the spotlight. 30. Today is Stay at Home Because You’re Well Day. Use this day to stay at home not because you’re working and not because you’re sick; simply take it to take it. Recharging your own batteries can make you a better employee to be around and your coworkers would definitely thank you for that. So do you think you can pull this off for 30 days? Which are you most looking forward to doing for someone? If you think your coworkers should help you spread the random acts of gratitude, please share this with them! This entry was posted in Culture, Employees, small business and tagged 30 Days of Gratitude, 30 Days of Thankful, Being Thankful, Gratitude by Natalie DeCario. Bookmark the permalink.